Having the ability to transfer points between multiple travel companies is great. I mean c’mon, who wants to be monogamous with their points? Not me! I’d take a 1:1 transfer between most airlines any day. It’s even better when there’s a bonus for transferring, like American Express recently offered with British Airways. Anyway, back to the point… (pun intended), not all points are created equal. No sane person person inside the points and miles community would make a transfer of 1 SPG point to .5 HHonors point. Even 1 SPG point for 1 HHonors point would be crazy, but thankfully that’s not even possible. 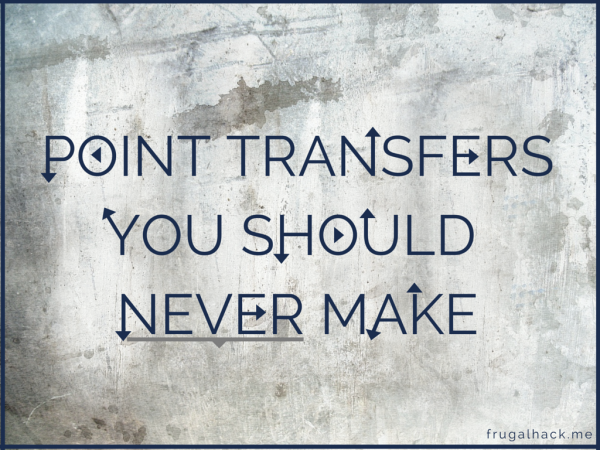 There are, however, some absolutely awful point transfer options out there that you should never take! That ratio may sound like the worst possible transfer ratio in the history of transfers, but it’s not. Don’t get me wrong, it’s bad; just not that bad. El Al’s award chart is much different from every other airline’s. Instead of the 67,500 miles American Airlines charges to fly one way from JFK to TLV in business, El Al only charges 3,000 points. Transferring 3,000 points into El Al would require 150,000 MR or DC points. That’s a big difference from AA’s price! JetBlue is unique since it’s revenue based. Instead of having an award chart, their point prices are directly tied into current fares. This means that the point price could change at any time, but on average each point is worth ~1.2-1.4 cents. To keep things simple, let’s say you’re trying to book a $100 flight with JetBlue points worth 1.4 cents each. In that case, it would require ~7,143 JetBlue points or 8,929 Membership Rewards points. Considering You could get 1 cent+ out of your MR points, this is a bad transfer. For fun, let’s say that each JetBlue point is worth 1.2 point when you are booking the $100 flight. That means it would cost ~8,333 JetBlue points or 10,417 MR points. If you booked that same flight through Amex travel, it would cost ~10,640 MR points after the 20% point rebate and you would earn miles for flying. So, in that case Amex travel would a better option! SFO to LHR costs 15,000 miles on Virgin. On AA, during off-peak months, it’s 20,000 miles. On United and Delta, it’s 30,000. In this scenario, Virgin seems like the better option, but it’s not. Why? Well, it would cost 30,000 MR points to get 15,000 miles on Virgin or 30,000 on Delta. Both of those transfers would get you from SFO to LHR, but Delta is the better option because they don’t charge fuel surcharges. The total cost would be $5.60 on Delta or $135 on Virgin. Which would you choose? The ratio for this could be considered 2.38:1 if you were transferring 60,000 MR points at a time since 60,000 MR = 20,000 SPG = 25,000 miles. That, however, still does not make this a good transfer. Considering SPG points are worth about 1.25 miles when transferred in 20,000 point chunks, the ratio should be, at most, 1.5:1. 65 to 1 is terrible to think about, but just like with El Al, Air New Zealand has a much cheaper award chart than most other airlines. For a one way ticket between HNL and SYD in economy, you’d be looking at 595 miles on Air New Zealand (or 33,675 SPG points after the 5,000 point bonus). For that same ticket on Qantas booked through British Airways, another SPG partner, it would cost 20,000 SPG points (after the 5,000 point bonus). The only downside to this would be the massive fuel surcharges Qantas charges. As another example, it’s 12,500 Avios (12,500 SPG points) to fly Alaska from SEA to HNL with no fuel surcharges. That same flight would be 745 Air New Zealand miles or 38,425 SPG points. Gol Smiles are far from valuable enough to each be worth two SPG points. For example, LAX-EZE is 35,000 Gol Smiles (55,000 SPG points after the bonus). That same flight booked on with Avios on LAN is 30,000 miles or 25,000 SPG points. Tough choice, isn’t it? There is absolutely no reason I can think of that would make this transfer a good idea. If you really need United miles, transfer them from Ultimate Rewards points at 1:1. Why waste two extremely valuable points for one inferior mile? Ratio: On average 10 to 1. As bad as 200 to 17. Hotel points are usually worth significantly less than airline miles, but they’re definitely not 200:17 or even 10:1 bad. As an example, let’s say we have 50,000 Gold Points that we want to convert at 200:17. That’s enough for one night (two nights with their credit card) at a top category Club Carlson property or 4,250 miles. 4,250 miles isn’t even a one-way flight! That same example at 10:1 is only 5,000 miles, which would get a flight under 650 miles booked with Avios. That, however, is nothing compared to two nights at a nice hotel if you ask me. I understand that it’s sometimes necessary to make a bad transfer to top up an award, but some of these are just terrible. They’re so terrible, that it’s almost better not to go… Hopefully, though, you’re never in a situation where you need the points badly enough to have to make one of these transfers. Did I miss any awful transfers?